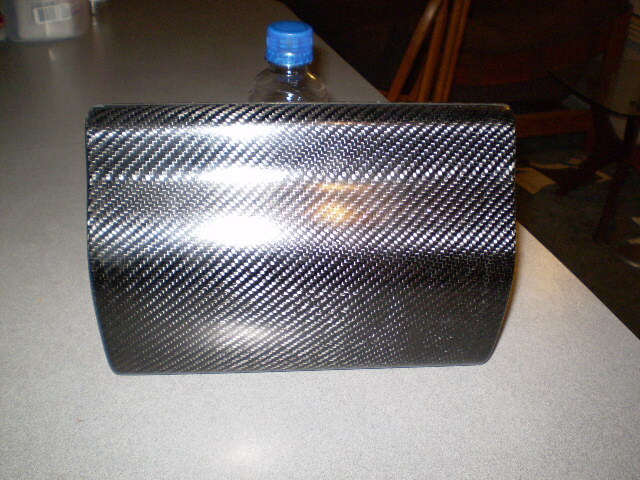 im posting my progress on the carbon glove box i have been working on for the last 3 weeks.very time consuming project.all the molds are done and these pics are of the first set of parts from the molds.the front half and door have a few minor imperfections from my vacuum not being strong enough.the back turned out perfect.these are layed up with a 2x2 twill pre preg peal ply and vacuum bagged.the box weighs just a few ounces.it will have a push button lock that has a recces in the door.the front half has a recess for where the door closes.so there is carbon behind it.the back half has joggle strips so both halves key together.so next i have to figure out the production details.i may have a high quality composites shop in portland do them.then i will do the assembly myself.i just wanted to post these pics and details.i will be out of town at the scca run offs for a few weeks.so when im back i will post fully completed pics and hopefully some prices and when i can have some ready for sale. the box is a snap to install.it just rotates into the try and i thought a strip of velcro across the back would be good.if you wanted a bit more security you could drill and tap the tray and run screws from the inside down trough the tray.when the door is locked you could not remove it.i posted a pic above with the radio face case,cell phone,wallet and there is still room for a small camera.what started this for me was the lack of a place for my cars paperwork.its just sitting in the tray.so at least now it wont blow away. i love it!! Great project. How would you deal with those who have the ipod hookup? I wouldn't want to lose that. im not sure how the i pod hook up works.i thought the mount puts it in front of the heat/ac controls.if you are talking about the wire coming of the back of the radio there is an inch between the the box and the radio. Remember, too, that the glovebox can be located anywhere along the length of the tray... so, if you need to leave a 1" gap to the right for your cords, you can do that. Looks cool, my fear is as a CF part it's gonna run $300. Do you have any rough idea of price yet? im still away on my trip. (now driving to the run offs)so i will not know for sure tell i get home and figure out a few things.i would like to get the price around 250.i could do them in a good grade fiber glass for less.then they could be painted body color. I guess I need to measure (I saw that the box is 10 1/8") and see if there is space. kmt63, the ipod connector consists of a black rubber thing mounted all the way to the right hand side of the tray. It has a couple of pre-cut slots for different sized ipods, and the ipod connector comes out from the right side through the black rubber thing. You plug your ipod in, then slip it into the black rubber thing, which holds it snugly. So there would be just a bit of the ipod sticking out to the left, where the right edge of the box would be, but no wire there. I will have to measure and see if there would be space. so you have the ipod holder that sits in the tray?i have seen holders that put the ipod out in front of the heat controls.this would work with the glove box.i can look at it and make a solution for it when i get back home. 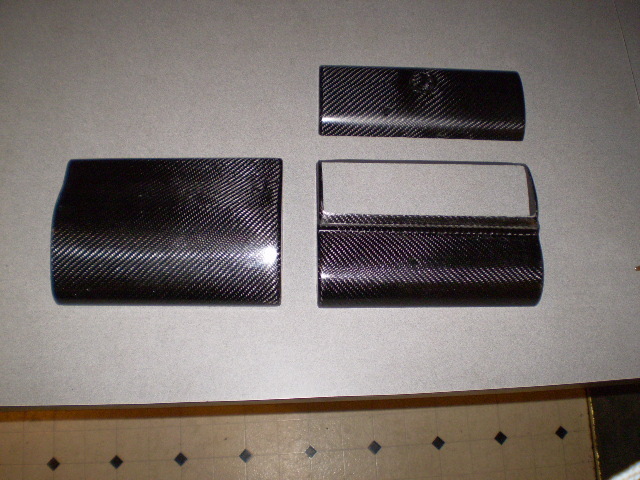 I took a look at it last night--if your design is 10 1/8" wide I don't think there is quite enough room, even if I were able to move the black rubber holder farther over to the right. Although I have to say in any case, I don't think I would be interested at $250-300. That's not a criticism, just me being a cheapskate. The way to deal with the ipod is to cut a slot in the bottom of the right side of the glove box just large enough to fit the ipod cable through. 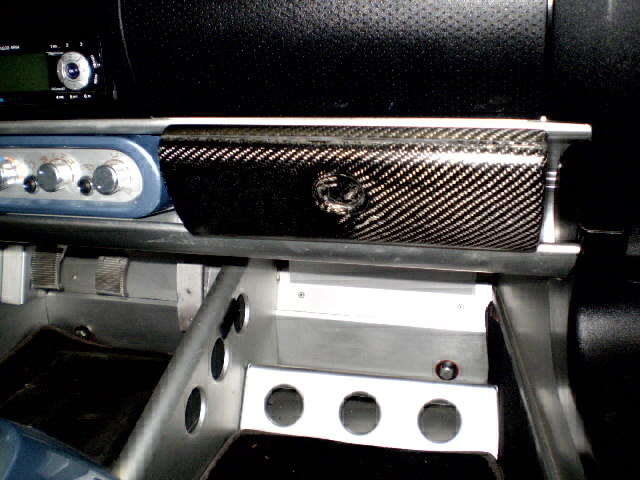 Remove the foam ipod holder and stick it (it is only held on with double stick tape) to the interior of the glove box (if you still wanted to use the holder otherwise omit that step). 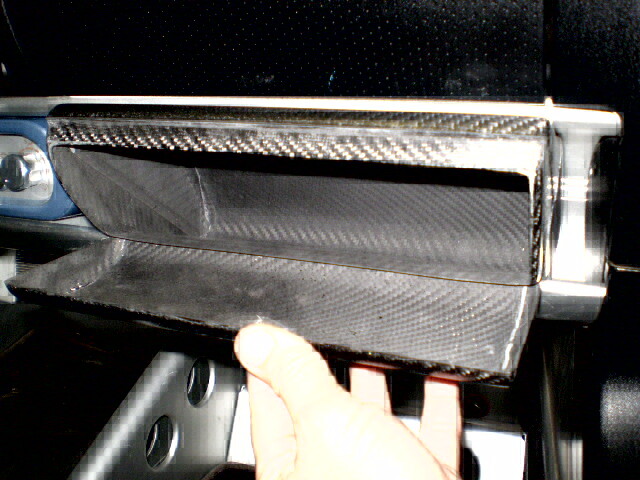 Then install the glove box all the way to the right of the tray thereby hiding all of the wiring completely. 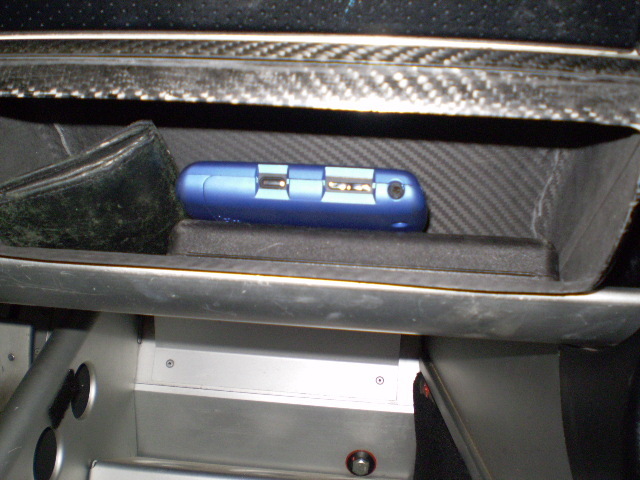 Now your ipod is stored in the (lockable) glove box. If it is drilled/tapped/screwed to the tray it is that much safer. That would work...for someone handy enough to do it. Any way to line the interior? 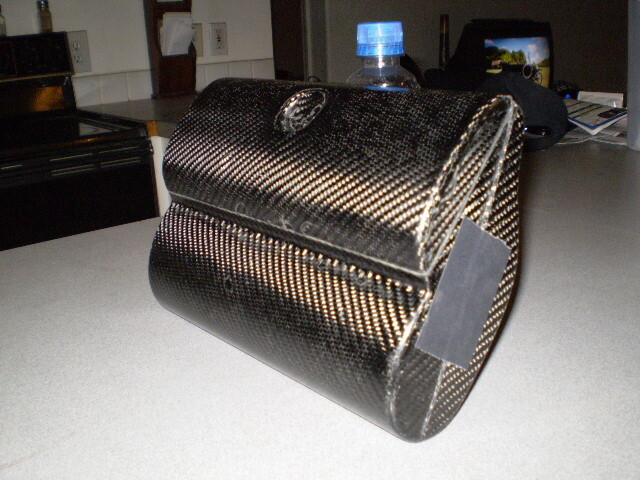 Carbon fiber makes a lot of noise. Other than that, I love it!